Those of you who periodically check this spot to see if I am really living up to my job as a bowl carver may have wondered if I have given up the craft since finishing that cherry 'Basket Bowl'. Well, I have been busy with what could best be called a diversionary project. 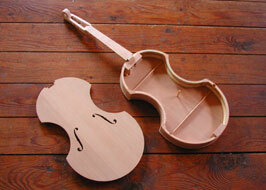 Below you can see the process of building a viola-sized bowed instrument. This started out to be a simple, quick and dirty, contemporary instrument but as soon as I began committing some nice materials, tiger-maple for the neck/head, hard-won piano soundboard spruce for the top and quarter-sawn cherry for most of the rest, well, let's just say that what I had planned on taking a day or two, took nearly a month to complete. Here you can see some of the major components laid out, ready to be assembled. The sides were shaped on a homemade 'bending iron'. 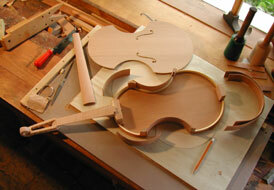 Kerfed and bent basswood lining is already in place to give a greater gluing area for the thin (1/16"- thick) sides. In this photo the sides (ribs) are in place and you can see the minimal back bracing and another no-no, a glued-in sound post. Broke a lot rules on this one. 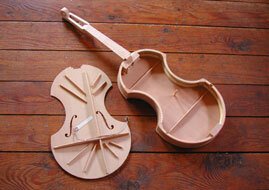 Actually, the construction process is more like that of a guitar than a violin. The top bracing was designed scientifically using a complex mathematical formula... right! I sized and placed the bracing to allow, as best I could estimate, a kind of soft, or resilient top. I was specifically trying to avoid the harsh sound I would have expected from a thin, brittle top. Mellow was what I was after. The instrument is closed in now, thanks to about a bazillion homemade spool clamps. By the way, the neck bolts on; from the inside, of course, to facilitate any future modifications or repairs. If that need does present itself I hope along with it comes a very small, strong entity to crawl in through a sound hole with the appropriate wrench. 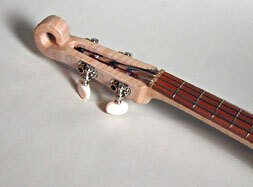 The instrument is completed except for final placement of the chin rest and possible replacement of the plastic knobs on the friction tuners with some cherry ones. In the middle photo above you can almost see that just for fun, I installed an inexpensive piezo film contact pickup inside, beneath the bridge. This is wired to an unobtrusive 1/8" jack in the side; one more 'contemporary' feature. 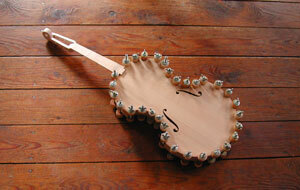 This instrument is now fretted! For a couple of reasons, including just plain wanting to try it, I installed some low frets (modified mandolin fret-wire). It plays nicely to pitch though I have lost the ability to do strong vibrato. The instrument is tuned like a violin G,D,A,E, but a whole octave lower. 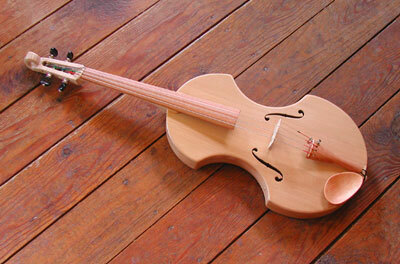 It is currently strung with the three smallest strings from a 1/8 Cello set and a viola D string as the highest string. Lessons learned: The frets will destroy expensive silver-wound strings. I'm now using cello rosin to activate the lower strings a little more. In general the instrument is not as responsive (slight delay getting the strings to sound) as with smaller-gauge strings but has a nice, full low end resonance that I didn't get with viola strings.